Buy X-Men books signed by Greg Pak at the Greg Pak Shop! The podcast of the superfun Jay & Miles X-Plain the X-Men panel I did at the Rose City Comic Con has gone live! Check it out here! Had a blast on that panel. Realized I’ve written a heck of a lot of X-Books over the years — X-Men Phoenix Endsong, X-Men Phoenix Warsong, Magneto Testament, Astonishing X-Men, X-Treme X-Men, Storm… even Alpha Flight with Fred Van Lente, which is kind of X-Adjacent. And we talked about a ton of those books! Especially Magneto and X-Treme X-Men. Jay and Miles are very, very funny and the audience was incredible. Enjoy! Just two days left to buy signed Greg Pak “Battlestar” and “Phoenix” trades in Planet Karen Benefit Auction! Greg Pak has donated signed trade paperbacks (including “Phoenix Endsong,” “Phoenix Warsong,” and three “Battlestar Galactica” trades) to the Planet Karen Benefit Auction, which is raising funds for webcomics creator Karen Ellis, whose home was recently destroyed in a fire. Just two days remain in the auction — click on the images below to bid today! Comments Off on Just two days left to buy signed Greg Pak “Battlestar” and “Phoenix” trades in Planet Karen Benefit Auction! Incredible Hulk #103: … Pak is the guy. In all this time, we’ve never really questioned the status quo of the Bruce/Hulk dynamic because everything was so good. Then in just a couple of panels Pak reveals it and â€¦it’s still just so good. Despite this storyline putting an acceptable epilogue on the Hulk’s saga, Pak even naturally spins into World War Hulk. Suddenly, I can’t wait. Phoenix Warsong #5: More Paktastic goodness, closing one book on Grant Morrison’s X-Men run while planting seeds for more storytelling. Though the artwork is a little uneven, this book never lets up, and never talks down to the readers. It’s not for the casual reader, but it is tremendously rewarding for long-time fans. Two comics written by Greg Pak hit comic book stores today. Click here for a preview of “Incredible Hulk” #103 and here for a preview of “X-Men: Phoenix – Warsong” #5. Tell your local store to hold copies for you today! “X-Men: Phoenix – Warsong” #4, written by Greg Pak with pencils by Tyler Kirkham, hits comic book stores on December 13. Ask your local comic store to order a copy for you today. If it’s better than it should be, it’s because Pak is a subtly humanistic writer, picking up the threads of Grant Morrison’s work on New X-Men and somehow bringing it all back down to a human level. Click here for the full review and ask your local comic book store to hold you a copy today. Two different Korean American heroes created for Marvel Comics by Asian American filmmaker and comic book writer Greg Pak will score some more panel time when “Incredible Hulk” #100 and “X-Men: Phoenix – Warsong” #3 hit stores on November 1. “Incredible Hulk” #100 is a special giant-sized anniversary issue that continues the ongoing “Planet Hulk” saga while including a 12 page back up story that ties into the current Marvel Civil War event. The 12 page back up story features the return of Amadeus Cho, aka Mastermind Excello, a boy genius on the run created by Pak for the “Amazing Fantasy” #15 anthology comic book. Click here and scroll to the bottom of the page to see images from the 12 page back up story. And click here for the first eight, lettered pages of the “Planet Hulk” story. “X-Men: Phoenix – Warsong” #3 continues to explore the eerie Stepford Cuckoos and their connection to the Phoenix. One of the supporting players in the book is Asian American S.H.I.E.L.D. 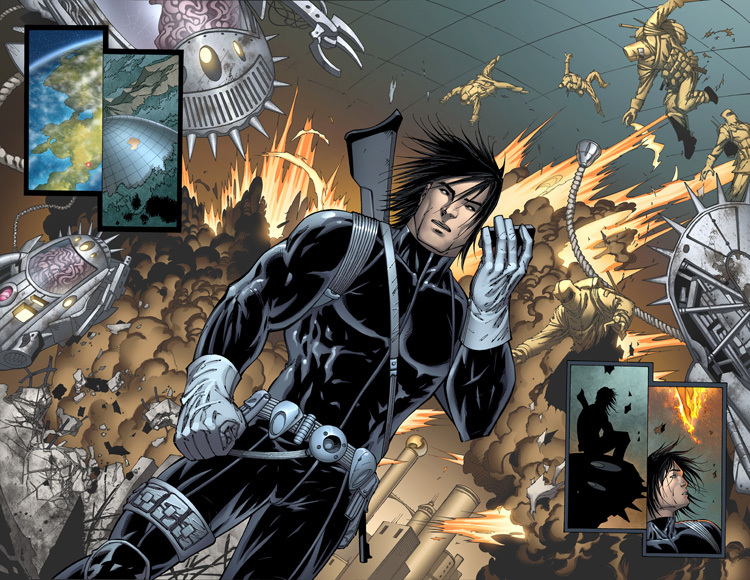 Agent Jake Oh, who was introduced in “X-Men: Phoenix – Warsong” #2. Click here for an image of Jake Oh from “X-Men: Phoenix – Warsong” #2. And click here for a four page lettered preview of “X-Men: Phoenix – Warsong” #3. Both “X-Men: Phoenix – Warsong” #3 and “Incredible Hulk” #100 arrive in comic book stores on November 1. Ask your your local store to hold copies for you today.